Calm Energy Dog-Show And Tell! What a great time the Calm Energy therapy team had last week at Brooklyn’s PS 203! Someone got smooched in the face! The fourth-grade kids had been doing a project on the Iditarod (yes, I just had to Google that spelling), so we and a few other Good Dog Foundation therapy dog teams went to meet the children at school so they could see, touch, ask and learn about different types of dogs. 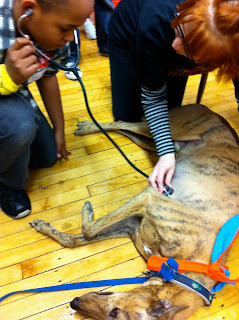 Because they’d been learning about dog racing, they loved getting to know our Greyhounds. They felt the dogs’ muscles and bones, listened to the dogs’ heartbeats, and learned why Greyhounds’ heart rates are so much lower than other dogs. They were very interested in the Greyhounds’ ear tattoos, which gave us a chance to explain why it’s so important to adopt a needy pet instead of buying one. Here’s a link to the full gallery of pics on facebook.com/calmenergydogtraining. A 3-way tie for most adorable. — Thanks to Terri Ciarmello and the fourth-grade class at PS 203!